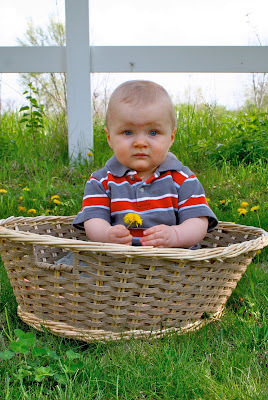 My Personal/Family Blog: Who doesn't put their babies in baskets? Bobbie and I had such a good time shooting pictures of the kids. After our experience with David's first photo shoot at Walmart, I think we may never go back to a studio. It is so much easier to do it at home! The kids are comfortable and can take a break when they want to, so much less stress, I love that. This picture cracked me up, especially when Bobbie said, "look at his crazy forehead fat going on!" She has a way with words doesn't she. Then we had a hilarious game of peak-a-boo which he got really into and laughed his little head off about. He is SOOO close to crawling, he is "creeping" right now. He gets up on his hands and knees and tries to move forward but doesn't have it quite yet. He is getting good at imitating things, it is cute to see them learn. Can you e-mail me your sister's address? I wanted to send them an invite to Elle's B-day party!